In the early 80ʼs Hannah spent a year in the heart of the Paris art scene, which led to a lifelong passion for sculpture, and in particular for bronze. Hannahʼs first career was in fashion, living and working abroad with clients as various as Valentino, John Galliano, Betty Jackson and Georgina von Etzdorf. Then 18 years ago she traded in her glamorous life in high fashion for plaster encrusted overalls and a blowtorch. 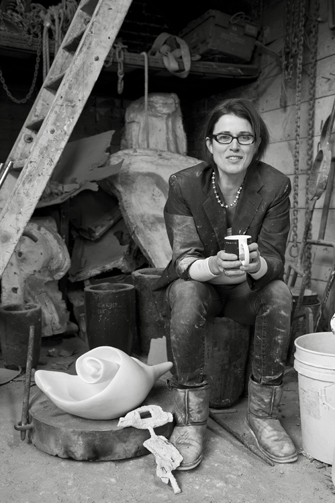 In 1991 Hannah began to study sculpture and the techniques needed to create her highly expressionistic lamps and sculptures. She attended David Reidʼs bronze casting course at Central St. Martins School of Art, an apprenticeship learning to weld at Capricorn Forge, and a Welded Steel Sculpture course at the Henry Moore Foundation.